If you remember watching the TV show (or movie) The A-Team, you’ll recognize that as the catchphrase of the team’s leader, Colonel John “Hannibal” Smith. This always made me laugh because the team was creating ridiculously ambitious plans and taking huge risks to pull off impossible missions. That makes for good TV, but it’s a terrible way to begin as a trader. There are all kinds of ways to start trading. Maybe your dad introduced you to trading (like mine did). Maybe you got interested in college. Or, maybe you just recently set some retirement goals and realized becoming a more sophisticated trader was a requirement for reaching those goals. No matter how or when you got started, if you’re like most traders, you’ve have a patchwork of experiences, including both successes and failures. And most likely, those experiences have led to nothing but confusion about where to go from here, and about how to achieve consistent success as a trader. If this sounds like you, I encourage you to have a plan that makes sense for you. Let’s look at 5 key components of any good trading plan. #1 – What Type of Trader Do You Want to Become? Do not, I repeat, do not decide what type of trader you want to be simply based on the pipe dream of how much money you can make. Every single person has a different trading style based on factors that have nothing to do with projected earnings. So before you decide what type of financial instrument you’ll trade, be sure to assess your own trading style. Otherwise, you’ll find yourself taking on too much or too little risk for your personal tolerance, and you’ll end up with a disaster. #2 – Do You Have All the Skills You Need? Most traders look at charts to help determine when to buy or sell. Interpreting charts, in the general sense, is something required of all traders. However, every investing style and every financial instrument requires its own specific suite of charts and rules to be followed. If you’re trading weekly options, there are a variety of things you need to know that simply won’t come up if you’re trading stocks. And trading Forex requires a completely different skill set. To be successful in your chosen trading niche, it’s important to master the skills you need for that marketplace and financial instrument. Make a list of the exact skills you need for the type of trading you will do, then systematically fill in your knowledge gaps. #3 – What DON’T You Need to Know to Start Trading? I’ve been trading for a very long time. I have an undergraduate degree in accounting and an MBA. I know a lot about trading. But, I don’t know everything. And that doesn’t matter, because I thoroughly know what I personally need to know to be a successful trader. There are many different indicators—hundreds if not thousands. There are many styles and strategies for trading. There is more data than you could ever look at in your lifetime. Most of it doesn’t matter to being a profitable trader. You don’t need to know everything about trading to be a successful trader. Trying to learn everything is just a distraction. So figure out what you don’t need to know. Keep your systems simple. Keep them repeatable. Make a constant and conscious effort to rule out the unnecessary from your trading system and your learning plans. Complexity is the enemy of execution and it will erode your profitability. #4 – What Trading System Will You Use? Are you able to write out the rules of your trading system on one piece of paper? If not, you don’t have a trading system. I know, I know… some of you are already thinking Yeah, but my system is complicated. If that’s you, see point number three. Is your system for trading simple and repeatable? If you can’t explain your trading system to someone else, you don’t have one. Without a trading system you’ll never know why you’ve succeeded. Accidental success is the worst thing that could happen to a trader. You must be looking for compound results to be successful over the long haul. #5 – Do You Have the Right Equipment to Trade? 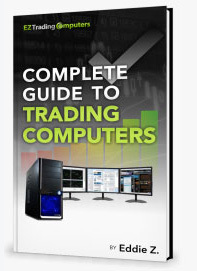 Make sure you have a computer that’s going to keep up with the type of trading you’re doing. If you’re a buy-and-hold investor, you don’t need much in the way of the equipment. Just about any computer will do. But if you’re a hyper-trader or trade Forex, futures, or weekly options, you need a more sophisticated piece of equipment. If you’re a high-frequency trader, you need a very fast machine. And, at the very least, get a computer with multiple monitors. If you’ve never had one, you’ll be amazed at the difference it makes in your productivity and in your ability to stay in touch with the pulse of the market. If you’re just getting started with trading, or if you’re heading into retirement thinking about trading more often, take some time to answer these five questions for yourself and create your own plan for success. And if you do find you need a better computer, check out our laptops and desktops custom-built for trading. Don’t forget to get multiple monitors. Everything we sell is built by traders, for traders, from the inside out.